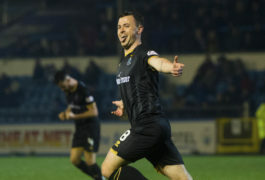 Darren McCauley hopes he has found his feet with Caley Thistle just in time for the Highlanders' promotion play-off bid. Caley Thistle midfielder Liam Polworth has signed a pre-contract agreement with Scottish Premiership side Motherwell. Caley Thistle struck late to secure a 2-2 draw against Morton at Cappielow which leaves them on the brink of a promotion play-off place. Caley Thistle midfielder Joe Chalmers says his Scottish Cup semi final appearance at Hampden Park today will be his token of appreciation for support of his family during his primitive years as a footballer. Mark Ridgers has already tasted Scottish Cup glory, but only from the fringes of the action. Caley Thistle chairman Graham Rae hopes today's Scottish Cup semi final against Hearts at Hampden Park will be another memorable occasion for the club's supporters to savour. Former Caley Thistle skipper Bobby Mann says coping with Hearts' physicality holds the key to Inverness' hopes of reaching the Scottish Cup final. The Scottish Cup brings fond memories to Jamie McCart's household but the Caley Thistle defender says his father Chris is too modest to raise the subject of his 1991 triumph with Motherwell. Aaron Doran is grateful for the opportunity to return to Hampden Park having feared for his future shortly after winning the Scottish Cup on his last visit to the national stadium. Caley Thistle manager John Robertson knows his Hearts counterpart Craig Levein will see Saturday's Scottish Cup semi final as a prime opportunity to take a giant stride towards ending his trophy drought. Charlie Trafford tasted IRN-BRU Cup glory with Caley Thistle last season, but the midfielder is relishing stepping it up another level in Saturday's Scottish Cup semi final against Hearts. Ryan Esson helped Caley Thistle thrive as underdogs in their last Scottish Cup semi final and he insists they must do so again when they face Hearts this weekend. Caley Thistle skipper Carl Tremarco insists he never lost belief Inverness could return to the national stage despite their relegation from the top flight. Caley Thistle have appointed Scot Gardiner as the club's new chief executive officer. Caley Thistle strengthened their grip on the Championship promotion play-off spots with a 1-0 victory against Ayr United at Somerset Park. Caley Thistle manager John Robertson is putting the onus on keeping Dunfermline behind them in the race for the play-offs - rather than catching today's opponents Ayr United. Caley Thistle midfielder Anthony McDonald says Inverness’ promotion push can to ease his frustration at missing next weekend’s Scottish Cup semi final against parent club Hearts. Caley Thistle midfielder Angus Beith has been forced to retire at the age of 23 due to a long-standing hip problem. Caley Thistle winger Aaron Doran feels he is reaping the rewards of his patience after winning the Ladbrokes Championship player of the month award for March. Caley Thistle's Aaron Doran and John Robertson have scooped the Championship player and manager of the month awards for March. Caley Thistle defender Jamie McCart insists Inverness cannot let Tuesday’s Highland derby defeat halt their play-off momentum. Ross County extended their lead at the top of the Championship to five points thanks to a 2-1 Highland derby victory at Caledonian Stadium. Ross County will give themselves some vital breathing space at the top of the Championship by beating derby rivals Caley Thistle tonight, according to three-quarters of the P&J's sports panel. Caley Thistle manager John Robertson is hopeful both his side and Ross County can secure promotion to the Premiership this season. Caley Thistle defender Brad Mckay has accused Ross County's Michael Gardyne of a lack of class over comments he made following the last encounter between the sides in February. Caley Thistle manager John Robertson has taken issue with the SPFL's rearrangement of tonight's Highland derby against Ross County. Five teenagers have been charged in connection with alleged vandalism of seats at Caledonian Stadium during the Irn Bru Cup final. Caley Thistle and Ross County have issued a joint statement condemning recent crowd trouble involving supporters of both clubs. Caley Thistle fear midfielder Sean Welsh could miss the rest of the season with a suspected broken metatarsal. Caley Thistle forward Jordan White faces competition to be the Highlanders' leading scorer but he is pleased his team-mates are easing the pressure on his shoulders. 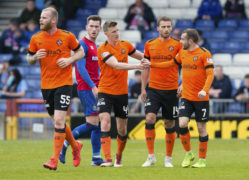 Caley Thistle moved a step closer to cementing a Championship play-off place with a 3-2 win over Alloa Athletic at Caledonian Stadium. Caley Jags midfielder Charlie Trafford was beginning to suspect that rumours of team-mate Aaron Doran’s brilliance were much-exaggerated. John Robertson insists there was “no sane reason” for the SPFL to plant the postponed Highland derby on a date opposed by both Caley Thistle and Ross County. Caley Thistle and Ross County have been fined £2,500 by the SFA following the melee during the last Highland derby. Caley Thistle chairman Graham Rae has shot down reports the club is in turmoil behind-the-scenes after a raft of staff departures. Caley Thistle returned to fourth place in the Championship after Tom Walsh came off the bench to net a stunning late winner to defeat Partick Thistle 2-1 at Firhill. The final Highland derby of the season, which was postponed last week, has been rescheduled for Tuesday, April 2. John Robertson hopes Tom Walsh can carry on where he left off after returning to the Caley Thistle squad. Caley Thistle midfielder Sean Welsh believes momentum is key for his club as they try to force their way into the Premiership play-offs. Caley Thistle's academy director Danny MacDonald has become the latest employee to depart the Championship club. The Highland derby between Caley Thistle and Ross County tonight has been postponed due to a waterlogged pitch. Caley Thistle midfielder Liam Polworth believes his side has more to lose as they prepare to face Ross County one last time this season.